The incidence of skin cancer is increasing by epidemic proportions. Basal cell cancer remains the most common skin neoplasm, and simple excision is generally curative. Squamous cell cancers may be preceded by actinic keratoses–premalignant lesions that are treated with cryotherapy, excision, curettage or topical 5-fluorouracil. While squamous cell carcinoma is usually easily cured with local excision, it may invade deeper structures and metastasize. Aggressive local growth and metastasis are common features of malignant melanoma, which accounts for 75 percent of all deaths associated with skin cancer. Early detection greatly improves the prognosis of patients with malignant melanoma. The differential diagnosis of pigmented lesions is challenging, although the ABCD and seven-point checklists are helpful in determining which pigmented lesions require excision. Sun exposure remains the most important risk factor for all skin neoplasms. Thus, patients should be taught basic “safe sun” measures: sun avoidance during peak ultraviolet-B hours; proper use of sunscreen and protective clothing; and avoidance of suntanning. One in six Americans develops skin cancer at some point. Skin cancer accounts for one third of all cancers in the United States. Most patients with skin cancer develop nonmelanoma skin cancer. This group of cancers includes basal cell carcinoma, the most common neoplasm worldwide, and squamous cell carcinoma. Fortunately, mortality associated with nonmelanoma skin cancer is unusual. However, malignant melanoma accounts for 75 percent of all deaths associated with skin cancer. Melanoma, the eighth most common malignancy in the United States, is the cancer with the most rapidly increasing incidence. One in 1,500 Americans born in 1935 were likely to develop melanoma, compared with one in 105 persons born in 1993.1In contrast to nonmelanoma skin cancer, which typically affects older persons, the frequency of melanoma peaks between 20 and 45 years of age. Mortality rates are higher in men than in women. This higher rate may occur because lesions tend to develop in less easily observed areas, such as the back, in men. Mortality is also increased in blacks for this reason, as is the propensity to develop more aggressive tumors and to be diagnosed at later stages. The rising incidence of skin cancer over the past several decades may be primarily attributed to increased sun exposure associated with societal and lifestyle shifts in the U.S. population and to depletion of the protective ozone layer. While early detection and treatment of skin cancer can improve patient outcomes, convincing data regarding the benefit of mass screening programs are lacking. In addition, the ability to identify potentially malignant lesions varies with physician training. 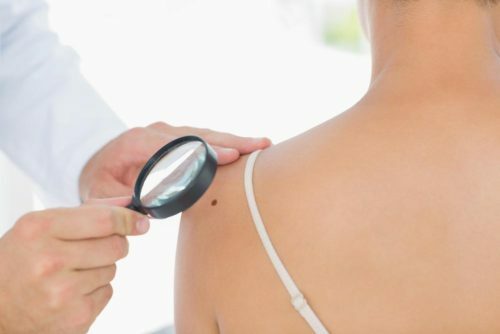 Thus, except for very high-risk persons with a history of skin cancer or atypical mole syndrome, for whom periodic screening is universally recommended, there is considerable debate about who should be screened, who should perform the screening and how often screening should be performed. Part of the screening process should include an assessment of patient risk. When screening is performed, the examiner must systematically inspect the entire skin surface. The patient should completely disrobe and remove concealing cosmetics. Daylight is the ideal light source, but full-spectrum halogen light or combined incandescent light (which accentuates red tones) and fluorescent light (which accentuates blue and yellow tones) is also satisfactory.Photographs may improve the quality of documentation and detection of lesion changes over time. Primary prevention of skin cancer is based on increasing public awareness of the risks of sun exposure and providing patients with individualized guidance. Patients who are educated about risk factors for skin cancer are more likely to self-select for clinical screening and to bring malignant lesions to the attention of a health care provider. Family physicians can easily integrate education regarding “safe sun” guidelines into general preventive counseling. While the role of sunscreens has been questioned, most evidence suggests that their correct use can lower the risk of skin cancer. Sufficient amounts must be applied at least 30 minutes before sun exposure, with reapplication after prolonged exposure or swimming. Most importantly, sunscreens will not be effective unless they are employed as only one element of a skin cancer prevention program.